Are you planning a Lake Tahoe wedding? Let the team at The Landing Resort & Spa help. 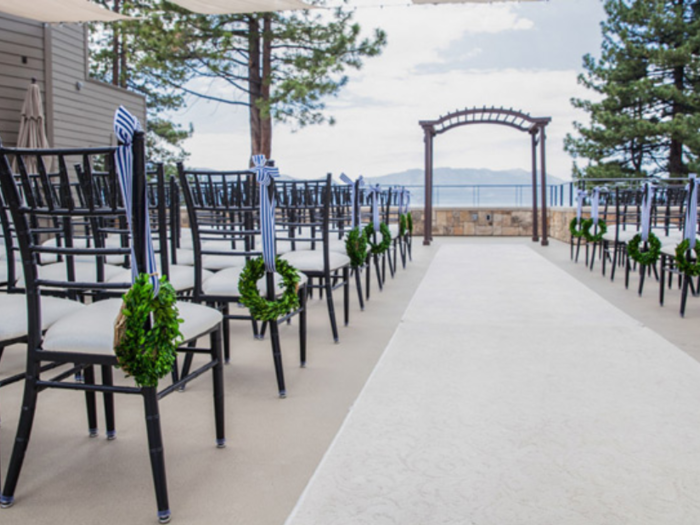 At our South Lake Tahoe boutique hotel, you can host a stunning outdoor ceremony on the beach or a sophisticated wedding reception from our rooftop terrace. Our ballrooms and smaller venues offer additional wedding venue options, all surrounded by Lake Tahoe's natural beauty. Plan a wedding at The Landing Resort & Spa and your family and friends won't just be impressed with the scenery. We are Lake Tahoe's most luxurious boutique hotel, complete with all the amenities, activities and ambiance you've always dreamed of for your special day. Browse some photos of past Lake Tahoe weddings hosted here and email us here or call our catering sales department at 530-600-3504x5540.